This weekend we had our first family stomach virus, a true milestone in parenting. Jackson woke up on Saturday morning sick. Sunday night, I went to bed early, my queasy stomach telling me I too had been bitten by the bug. I’ll spare you all the details, but at the pinnacle of our monumental family milestone, Jackson woke up crying around 3am. Jared tried to console him to no avail, so he brought him to me to nurse him in bed. Within seconds Jackson was calm. And seconds after that, I pulled away, tossed him back to Jared and ran to our bathroom. Through the walls, I could hear our poor baby bawling. I felt terrible, but knew his daddy had him until I could get to him again. And then I heard sounds echoing my own from the other bathroom. Oh no. Not Jared too. As soon as I could, I rushed to Jackson’s room. Pitiful baby was sitting up in his crib with all the lights on in nothing but a sloppily placed diaper, sobbing. Apparently, daddy had been bitten by the bug mid diaper change. I re-aligned his diaper, zipped him back into his footie pajamas and rocked and nursed him. I prayed “God, just 10 minutes. Please just give me 10 minutes to get him back to sleep in his crib.” He answered and gave me exactly enough time, no more, no less. These are the moments I wondered about before having kids. The last stomach virus I had was in my first trimester when I was pregnant with Jackson. It was the first time I truly feared becoming a mom and questioned whether I had what it took for the life long commitment of motherhood. I wondered if I’d be able to handle sickness with a baby or child or the sleepless nights. And now I know, it may be really hard, but apparently I can do it. I’ve been to the edge (of the toilet seat) and back. I’ve conquered the throne. I’ve, well, you get the jist of it. I somehow feel accomplished now. Like I’ve come into my own as a mom. So what if I laid on the floor and let Jackson eat peanut butter straight from the jar for lunch. So what if we watched two episodes of Sesame Street from the DVR. So what if I still have cheerio crumbs and peanut butter stuck in my carpet. So what. I did it. I made it through. Some days that’s the best you can do, just make it through. And I did. Today I finally felt like my normal self again. After little but broth and pasta for the last couple of days, I was in the mood for a real meal. 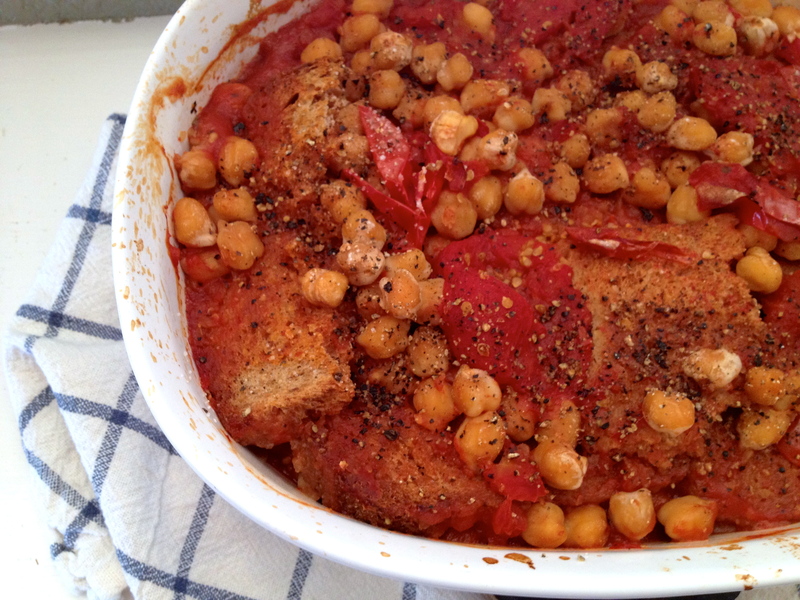 This Italian Chickpea Bread Casserole hit the spot. It’s warm and comforting and, though it takes a little while to simmer and cook, was very simple to make. I love the different textures in this dish: crunchy on top, fluffy soft cloud-like in the middle, chewiness in the chickpeas. A texture party in my mouth. Drain soaked chickpeas and return to large pot. Add first eight ingredients. Cover and bring to a boil. Then simmer covered on low for 30-45 minutes (until chickpeas are cooked through—if using canned chickpeas you can cut time to 15 minutes), stirring occasionally. Meanwhile, preheat oven to 350. On a baking sheet, line up bread slices and brush one side with a little olive oil. Place in oven (you can start while it’s still preheating) and bake until the bread is hard, but not burnt (I baked mine for 15 minutes, flipped it and baked for another 15). 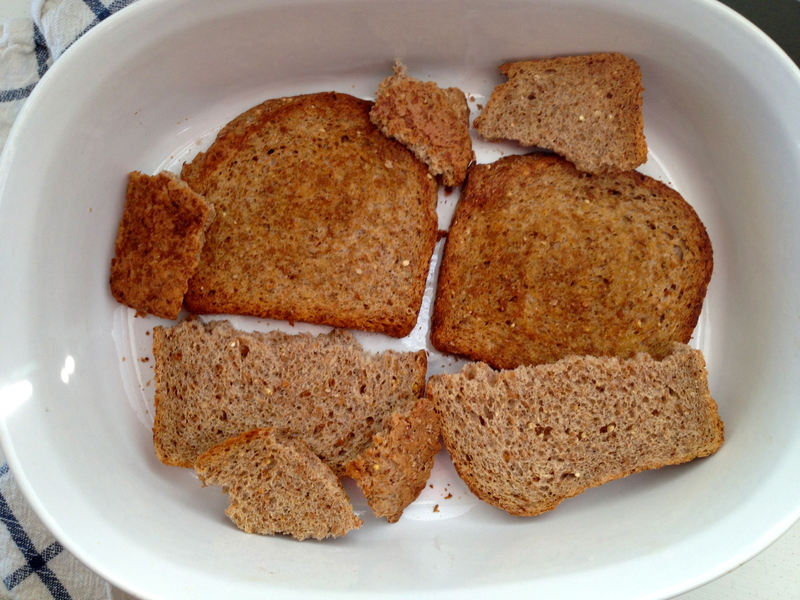 In a high-sided casserole dish, lay out four of your pieces of toast. Breaking them up as needed to fit. It doesn’t have to be perfect. No need for perfection, just fit it in there. 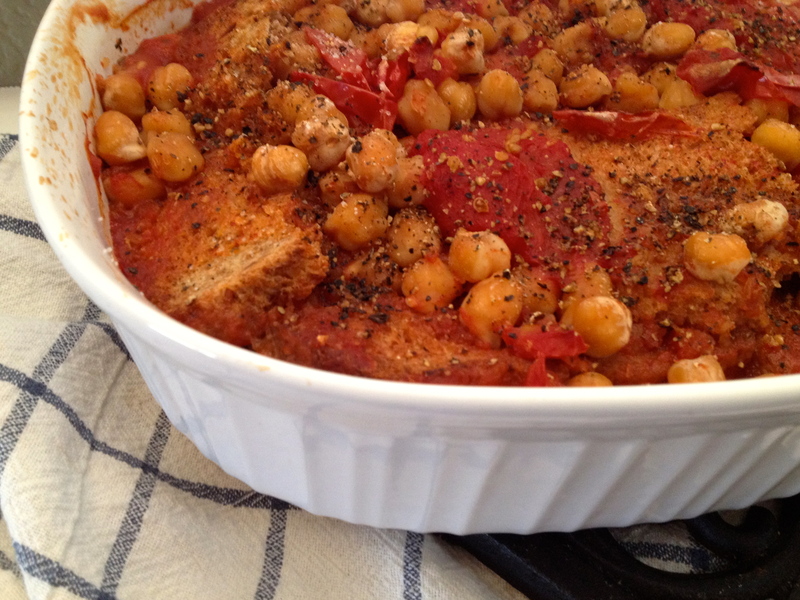 When your chickpeas are cooked through, pour half of the tomato mixture over the bread. 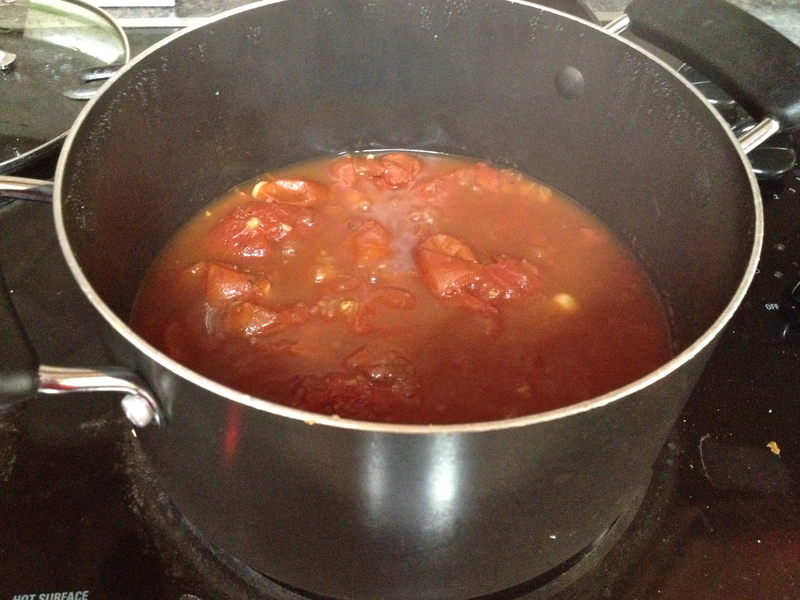 Then repeat with the remaining bread and tomato mixture. Simmering chickpeas with the tomatoes and seasoning. Sprinkle the top with salt and fresh crack pepper. Bake for 30 minutes. While this is baking, you can either kick back and relax, make a side salad or veggie and or caramelize some balsamic onions for the top of the casserole. It’s good either way, but who doesn’t love a little caramelized onion on just about anything? 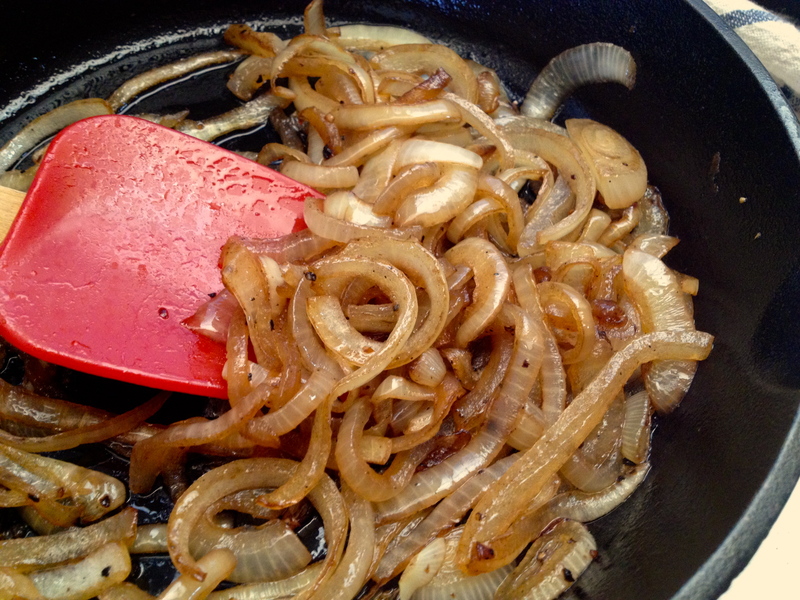 Pour oil and butter into a cold skillet, heat to medium and add onions. Stir and simmer for 10 minutes. Add remaining ingredients, reduce heat to low and simmer for 20 more minutes or until the onions are soft, brown and completely cooked through.